Dropping Bitcoin prices is not only crashing altcoins and businesses that have built empires around Bitcoin but the impact is now being felt by adopters and crypto payment processors. While we expect this drop to temper participants, shaking out speculators and sparing enthusiast keen on seeing the network flourish, platform robustness is top priority. Conduits as BitPay and Edmonton’s Coinpayment are cogs that not only spur adoption but are platforms through which the crypto-curious can experiment on in real-time while demonstrating how Bitcoin is an efficient, censorship resistant fiat alternative. Eventually, many experts expect Bitcoin prices to recover and this will definitely lift investor confidence allowing them to spend rather than hold. While volumes are dropping, our attention shifts to Bakkt and their announcement that they shall put off the launch of the much anticipated Bakkt Daily Bitcoin Futures to Jan 24, 2019. However, this is heavily dependent on approval from US regulators. Through a post, Kelly Loeffler, Bakkt CEO said the platform is taking this time to onboard as many customers as possible while ensuring the final platform is reliable and secure. It appears as if BTC/USD is steadying while bears slow down. Of course, from a top down approach price dents in the weekly charts are deep—down 22 percent. In the daily chart, BTC/USD is down 2.5 percent in the last 24 hours. But after a clear imbalance, prices will naturally level out. For equilibrium, BTC/USD prices will either consolidate within Nov 20 high low or drop lower. Following periods of consolidation, BTC/USD is now bearish thanks to last week’s declines below $6,000. Not only will double digit weekly and monthly losses confirm this trajectory but a simple trend line connecting highs of the last six days prints a perpendicular line. That’s how sharp declines have been. Though we hold a bearish stance thanks to candlestick formation and resurgence of sellers, volumes paint a different story. Of interest are bear bars of Nov 14—69k, Nov 19—74k and Nov 20—117k. Notice that volumes have been increasing but on Nov 20—despite relative high trading volumes—117k almost four times the normal average of 37k, the resulting trading range was tight at $750. This is nothing incomparable relative to Nov 14 and 19 losses averaging $800. At the back of these increasing volumes we expected wide trading ranges that could have seen BTC/USD trade below $4,000. However, that didn’t happen. Instead we had a bear bar with a long lower wick hinting of support and subsequent bars have been tight and ranging. After three months of accumulation, last week’s drops below our supports at $5,800–$6,000 did print a bear break out pattern. Even if the losses are huge, we expect a pull back as break out pattern demands. In that case, we might see a retest of Nov 19 highs of $5,000 and if buyers build enough momentum now that prices are down +80 percent from 2017 peaks, BTC/USD could close above $6,000 by the end of the year. Overly, Bitcoin fundamentals paint a rosy picture and prices would rise if there is Wall Street involvement. Since we expect Bakkt to launch next year and the SEC follow a month later with their decision on Van Eck Bitcoin ETF; traders have to contend with retail demand through December. 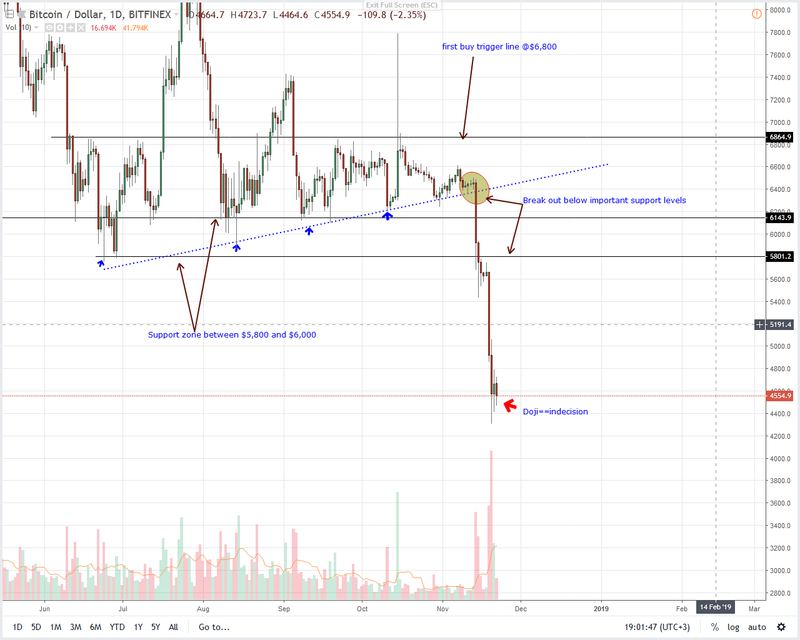 Drawing conclusions from the chart, we expect BTC/USD to recover and perhaps print above $5,000 by the end of the week all thanks to the imbalance of the last nine days.